This email was from a print vendor I have used in the past. I was intrigued. I usually just delete these promotional emails but the subject line caught my attention this time. Upon reading the first sentence, I realized this was a heartfelt message. Overnightprint's Chief Management Officer, Michael Wolfe, described in detail how the company had let customers down. He was brutally honest! A trait that so many of us push down for fear of rejection or for exposing our imperfections. He followed up with how the company will do better and extended an offer to customers to further express his gratitude for their understanding. He even gave out his personal phone number so people could call him directly! I applaud you, Michael Wolfe, for being transparent and honest. For following up and for being willing to do what was uncomfortable but probably needed. And because of this email, I was lead to design something to be printed. I want to take advantage of the improved services. This is the power of being honest! It is a lesson to all business owners - we are human, we flub up. Take accountability and rectify the situation. Yes, it hurts the wallet when we have to spend more time correcting our errors, but this is business. And if you don't correct your errors and take care of your customers, you won't have any customers to care for at all. Alicia White, CEO and Founder of Back of the Room Productions™ and SpeakerSheets.com, helps speakers, coaches, authors, and business experts give their message legs long after they leave the stage through professional branding and powerful products. 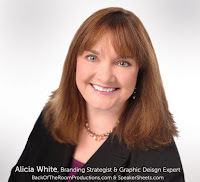 From speaker sheets to back of the room products, clients receive high-level graphic design and expert branding strategy that leads them to speaking success!